No more turning your back to the students, or if you were like me, spending 5 minutes just to figure out which way to put the paper under the document camera so it displayed correctly on the board. In today’s world of Education Technology there are a plethora of “gadgets” that can be appealing to teachers and school districts but sometimes they aren’t always the most efficient and effective. One of the many effective strategies that I use and would like to share it here goes hand in hand with effective teaching: the use of strong and weak models and student work. When I think of my years in the classroom and the classrooms I’ve seen in several districts across Louisiana many teachers are using document cameras to engage students in these strategies. While I used to love a document camera as much as the next guy I also know how cumbersome my document camera could sometimes be. Sounds familiar? This is exactly why I am obsessed with the Promethean solutions that allow teachers to “toss” the document camera! 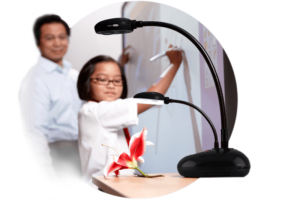 My two favorite strategies to use that replace the document camera are importing PDFs or screenshots into ActivInspire and ActivCasting. Many teachers are familiar with ActivInspire and flipcharts but often forget that PDFs import easily and allow for easy and quick annotation. No more bending over and turning your back to the students to write under the document camera, or if you were like me, spending 5 minutes just to figure out which way to put the paper under it so it displayed correctly on the board. I know what you’re going to say next… “But what about student work? Those aren’t PDFs?” If your students are posting to Google Classroom, BlackBoard, on Nearpod, Classflow, etc. simply use the camera tool in ActivInspire to screenshot their work and it is instantly added to your flipchart! If you are using Promethean’s ActivConnect G or “the magic sliver box” as some refer to it you have the option to use ActivCasting. While ActivCasting can be useful in several ways, my favorite, especially as a former math teacher, is to use it for mirroring models of student work for the whole class to see. My students LOVED to come up to the board to show their work but they weren’t always very efficient and when time is of the essence I wasn’t always able to allow them to do so. With ActivCasting all I have to do is have them mirror their device (chromebook, laptop, ipad, cell phone, or desktop) to my board/panel or use my cell phone or ipad’s camera to snap a picture of it straight from their desk. If your students have devices, or you have a para or SPED teacher in the room with you, two devices can be mirrored at one time. This is a great way to compare or analyze student work from two different points of view, or show how two students worked the same problem differently but still arrived at the same solution.